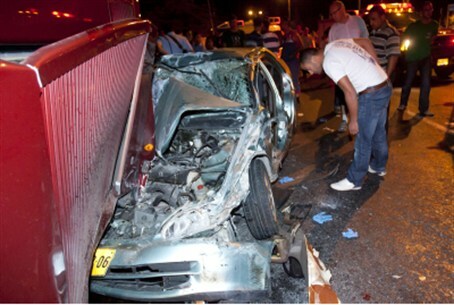 A senior officer in the Fire and Rescue Services, a resident of the Judean city of Kiryat Arba, was killed in a car crash Friday. The victim of an early morning car crash has been identified as 55-year-old Yinon Yitzchaki, a senior officer in the Fire and Rescue Services. Yitzchaki lived with his family in the city of Kiryat Arba in Judea, where he served as head of the local fire department for years. For the past three years he has served as the head of the Fire and Rescue Services academy. He was killed in a crash between his car and a truck on Highway 35, near Beit Guvrin. Yitzchaki died instantly; the truck driver was lightly injured in the collision. Yitzchaki will be laid to rest Friday aftenoon at the Har Hamenuchot cemetery in Jerusalem. The funeral procession will leave from his home and proceed to the Kiryat Arba fire station before proceeding to the capital. The family suffered a similar tragedy seven years earlier, when Yitzchaki’s daughter Neta, 26, was killed in a car accident next to Shilo in Samaria (Shomron). Family members said Neta and her father were particularly close. Also Friday, a 20-year-old female soldier was declared dead in Rambam Hospital in Haifa, hours after suffering serious injuries in a car crash. A six-year-old boy remains in hospital in serious condition with injuries from the same accident.